Article written by Tom Kennedy, brantnews.com. When marathon mom Krista DuChene said she was taking some time off from training, she didn’t mean she was kicking back to relax. In fact, what the Canadian champion long-distance runner really meant was she would be lowering her time spent running to a not-so paltry 80 km a week. The 33-year-old runner, who has been dubbed the “marathon mom”, will be taking some time off this year to prepare a six-year plan with the end goal being a spot in the Canadian Olympic team. “I’m taking some time off short term, for a long term goal,” she said. “I have huge plans for the future. I would love to try to qualify for the 2016 Olympics.” DuChene was recently crowned a Canadian champion after she finished the 36th annual Ottawa Marathon with a time of 2:39:08, the fastest Canadian woman in the field and sixth overall in her division. While her run proved she has got what it takes to be at the top of her chosen game, DuChene said a break was necessary if she wanted to continue in the sport. “As much as I’d love to keep running, I just need to slow down,” she said. “Four marathons a year is a high pace. It’s too much and I’d certainly get injured.” Her regular training, in preparation for the Ottawa Marathon, consisted of running 100 km a week for five months. “It’s basically a break as in I won’t be doing a fall marathon,” DuChene said. 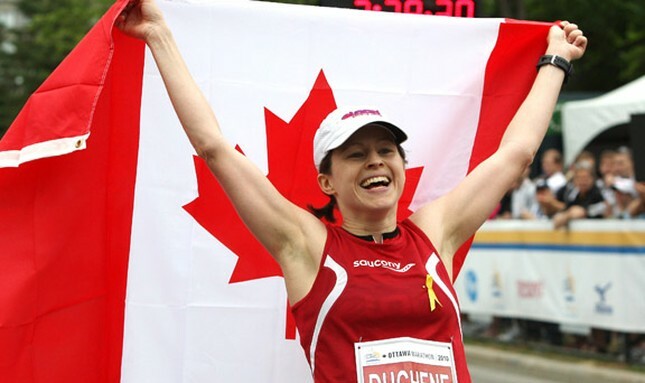 DuChene’s first marathon was in 2002 and she has run seven marathons in the last eight years. She was given the title marathon mom after she continued to run after the birth of her two children, Micah, 4, and Seth, 2. While the runner, mother and part-time dietitian has much to keep her busy, DuChene said she can’t escape her love of running. “They call me the marathon mom. In one day, I have to have my workout planned, look after the kids, go to work and have dinner planned,” she said. “There’s a lot to consider to balance it all, but I’m just so passionate about it.” Since the birth of her children, DuChene has ran four marathons and cut her time down significantly from three hours and 28 minutes, in her first, to two hours and 39 minutes more recently. DuChene attributed much of her growing success to bringing on coach Nicole Stevenson of Toronto, who she works with on planning, training and strategic race choices. “It’s not like the more you do, the better you are,” DuChene said. “It’s about choosing the right races and performing well in them.” DuChene’s time of two hours, 39 minutes, is just eight minutes shy of the Canadian standard to qualify for the Olympics. Bringing her time down will require some work in the future and attendance at some shorter-distance events to bring up her speed. But for now, Brantford’s marathon mom is kicking back. Sort of.